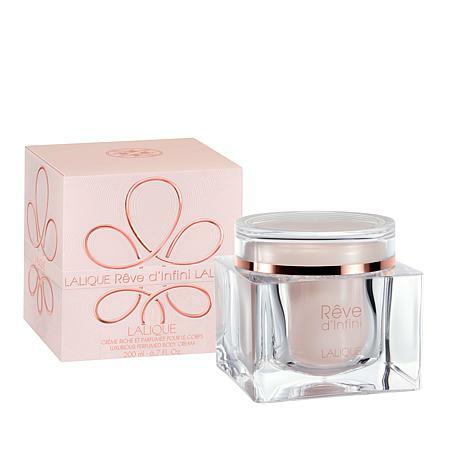 Lalique Reve d'Infini Body Cream 6.7 fl. oz. Lalique Reve d'Infini Body Lotion 5 fl. oz. This is a beautifully scented cream that matches the eternal feminine Reve d'Infini perfume. Ingredients: Aqua (Water), Parfum (Fragrance), Glycerin, Butyrospermum Parkii (Shea Butter) Extract, Prunus Armeniaca (Apricot) Kernel Oil, Hydrogenated Polyisobutene, Carbomer, Polyacrylamide, Stearyl Heptanoate, C13-14 Isoparaffin, Sodium Hydroxide, 1,2-Hexanediol, Caprylyl Glycol, Hydrogenated Polydecene, Stearyl Caprylate, Tocopheryl Acetate, Butylphenyl Methylpropional, Potassium Sorbate, Benzyl Salicylate, Laureth-7, Hexyl Cinnamal, EDTA, Citronellol, Alpha-Isomethyl Ionone, Hydrogenated Lecithin, Phenoxyethanol, Coumarin, Limonene, Linalool, Sodium Benzoate, Geraniol, Citral.